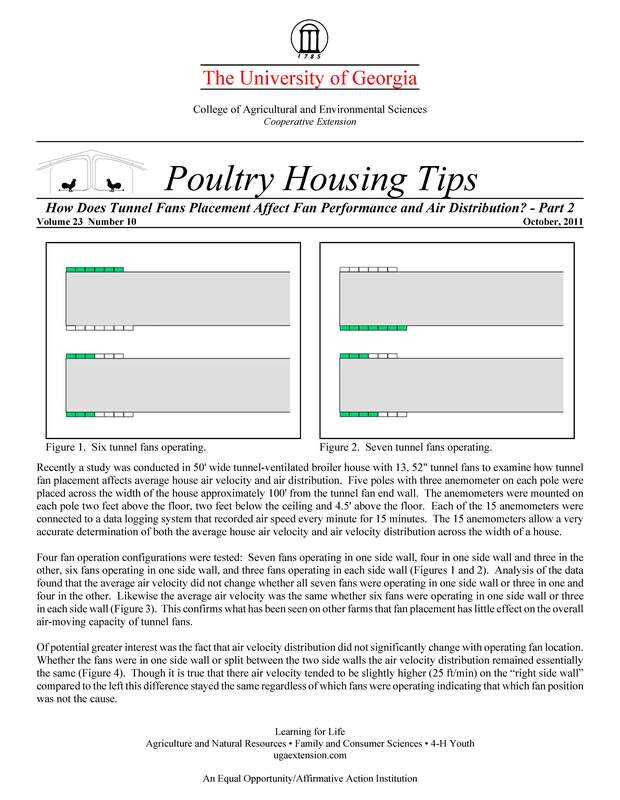 Recently a study was conducted in a 50' wide tunnel-ventilated broiler house with 13, 52" tunnel fans to examine how tunnel fan placement affects average house air velocity and air distribution. Five poles with three anemometers on each pole were placed across the width of the house approximately 100' from the tunnel fan end wall. The anemometers were mounted on each pole two feet above the floor, two feet below the ceiling and 4.5' above the floor. Each of the 15 anemometers were connected to a data logging system that recorded air speed every minute for 15 minutes. The 15 anemometers allowed a very accurate determination of both the average house air velocity and air velocity distribution across the width of a house. Four fan operation configurations were tested: seven fans operating in one side wall, four in one side wall and three in the other, six fans operating in one side wall, and three fans operating in each side wall (Figures 1 and 2). Analysis of the data found that the average air velocity did not change whether all seven fans were operating in one side wall or three in one and four in the other. Likewise, the average air velocity was the same whether six fans were operating in one side wall or three in each side wall (Figure 3). This confirms what has been seen on other farms, that fan placement has little effect on the overall air-moving capacity of tunnel fans.